In this article we go over some of the frequently asked questions about laser cataract surgery. Cataracts affect more than 24 million people in the US alone. A cataract clouds the lens of the eye which can lead to blurred or fuzzy vision. They usually appear in adults over 40 years of age. There is no avoiding our bodies and eyes deteriorating with age. Unfortunately, this means there is no way to prevent cataracts developing. Difficulty in distinguishing colors, sensitivity to glare or distortion in vision may indicate that a cataract is developing. But, there are solutions to correct the problem. Traditional cataract surgery is one of the most performed procedures in the world. Every year, more than 1.5 million operations are performed in the US. However, more than ever, people are choosing to have laser cataract surgery as an alternative. Traditional cataract surgery is very effective and successful. However, using a laser to perform cataract surgery improves the accuracy and precision of traditional surgery. This helps to reduce risks and improve the outcome of the procedure. Success rates are around 98%. For the best possible improvement to vision, laser eye surgery is the most successful. During traditional surgery, the eye is operated on with scalpels and other handheld instruments. With laser cataract surgery, the surgeon performs the same procedure but with laser accuracy. As every eye is unique, an ultrasound imaging devise is used to make a 3D image of the eye prior to surgery. This image allows the laser to be programmed to make incisions in the exact location and depth required. The surgeon then uses the laser to make an incision into the cornea and a precise opening into the lens capsule. The cataract is then softened using the laser energy. This helps break the cataract into small fragments. An ultrasound probe is then used to suction these pieces out of the eye. A lens – known as an intraocular lens – is then inserted to replace the eyes natural lens. The cornea is shaped to the correct fit for the rest of your eye. The whole procedure takes around 10-15 minutes. During laser cataract surgery, the entire lens of the eye is removed. As a cataract is a clouding of the natural lens, it cannot come back. Intraocular lenses cannot form cataracts. Years after surgery, some people can experience a clouding of the capsule supporting the replacement lens. 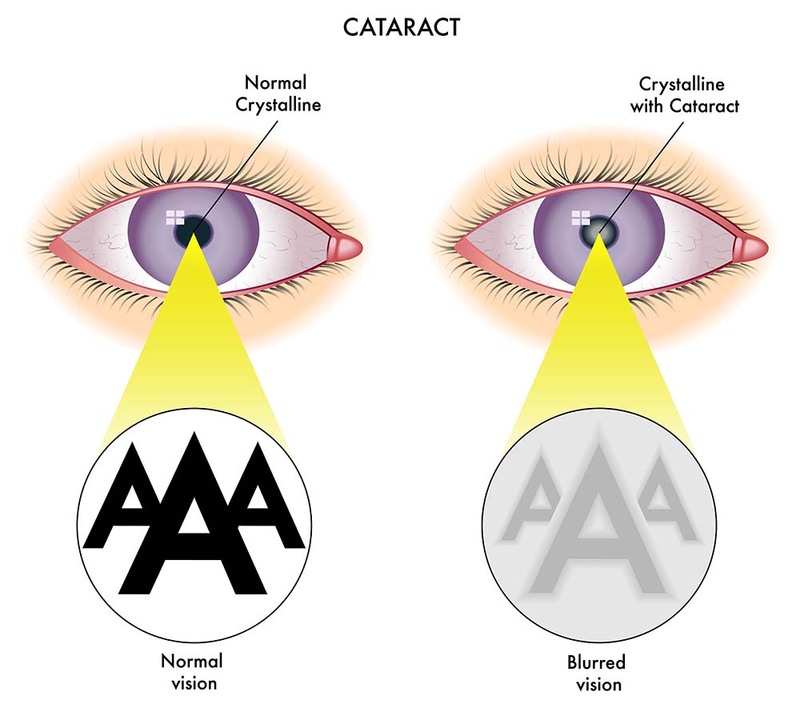 However, this is not a cataract. Is the surgery painful afterward? During the laser cataract surgery itself, you remain awake. There is little to no discomfort as steps are taken to ensure you feel no pain before and during surgery. After the procedure, you should feel only some slight discomfort. Some people experience a mild stinging sensation. Others feel a small amount of pain which can be alleviated with mild painkillers. In general, laser cataract surgery causes very little pain. Recovery time varies from person to person. On average, eyesight should return to normal within the first couple of days. Vision may be slightly blurred straight after the surgery. During the first 24-48 hours, patients should see the improvement and have clearer vision. There may still be some hazy vision and your eyes will be very sensitive to light. It can take up to two weeks for the eye to adapt to the new intraocular lens. How long until I can see normally again? For the majority of patients, full recovery takes three to four weeks. After this time, your vision should be much better than before the laser cataract surgery. You will be able to see “normally” without the use of glasses! As with any surgery, it is important to follow the advice of your surgeon. This will help ensure a rapid recovery. It is important to give your eyes the time they need to heal. Avoid driving after laser cataract surgery. Arrange for a friend or family member to drive you home, or arrange a taxi. It is important that you avoid rubbing your eyes in the week following surgery. You will usually be given goggles or a protective eye shield to wear to help with this. They will also need to be worn for the first few nights while sleeping. Your eyes may be more sensitive than usual to light. Wearing sunglasses – both inside and outside – will limit the exposure to bright lights. For at least a week, avoid heavy lifting. Light housework and walking are okay. However, avoid strenuous exercise. Also avoid swimming pools. They can harbor a number of diseases which is the last thing your body will want to encounter. Make sure to monitor your own recovery progress. Although you should be given a follow-up appointment, be aware of any worsening of your eyesight. If there are any changes in your field of vision, a discharge or persistent pain, contact your doctor immediately. I’ve had other eye surgeries; can I still have laser cataract surgery? In short, the answer is yes. If you have had operations for cataracts or other eye problems, it is possible to have laser cataract surgery. Even if you have previously had laser cataract surgery, you should be able to go through the procedure again. There are a number of reasons why cataract surgery could be required again. As people get older, the eyes naturally change. This means that, over time, the permanent changes made during the cataract surgery become less affective. Every person is different, so each individual has to be consulted with before being able to undergo laser surgery. Will I still need to wear my glasses? One of the aims of laser cataract surgery is to eliminate the need for glasses. The procedure will correct vision to a much better standard than when using glasses. It should leave you with crisp, clear vision. The majority of patients can expect to read as well as they do with glasses or contact lenses.